This truck is from the new Tonkin 1:64th scale Series produced for Western Distribution. Features include a Kenworth W 900 tractor with detailed interior, massive W900 grille, turnsignal lamps on the fenders, Chrome headache Rack and overall outstanding detail. 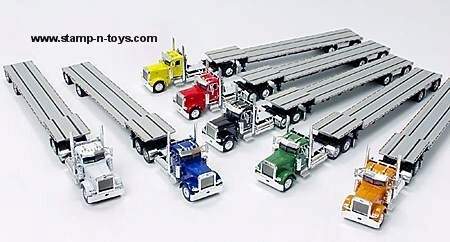 Trailer is an arched spread-axle flatbed and also has great detail. Comes new in the box.